Dan appeared on Good Morning America today to discuss yet another ocean-sport related case. Today, he looks into the recent developments in the disappearance of Rebecca Weiss, who vanished while snorkeling at a five star resort in California. 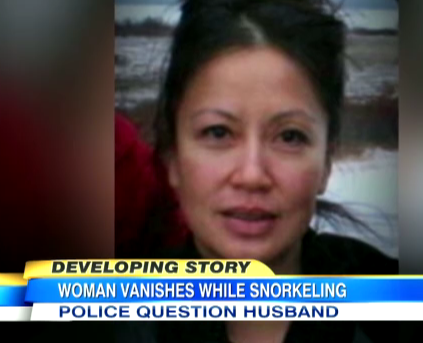 She was an experienced diver, whose husband reported her missing over the weekend. But after four days of searching to no avail, the police are shifting their investigation. Her husband, Alan, discovered her car and dive bag at the cove and led investigators there. Other suspicious activity includes the lack of any witnesses to her entering the water, the lack of her car keys and cell phone from her bag, and the fact that her bag was so far from the water. Investigators insist the husband is not a person of interest in the case, but Rebecca’s mother said he had been having an affair. So what does Dan think? “Well, you gotta start questioning the husband. Why? He was the last person to see her alive, he’s the one who says that he found her belongings on the beach, and after all, he is the husband — so these are all things that lead you to, number one, want to get as much information as possible from him as you can, and, number two, rule him out as a possible suspect,” answers Dan. As for the mother’s concerns? “It’s relevant, it’s important, but it’s certainly not enough,” says Dan. Watch the video here.